The Newspaper theme is designed to display similar posts at the bottom of every article. In the Related Articles section, the theme displays three or five articles per row, depending on the selected layout. 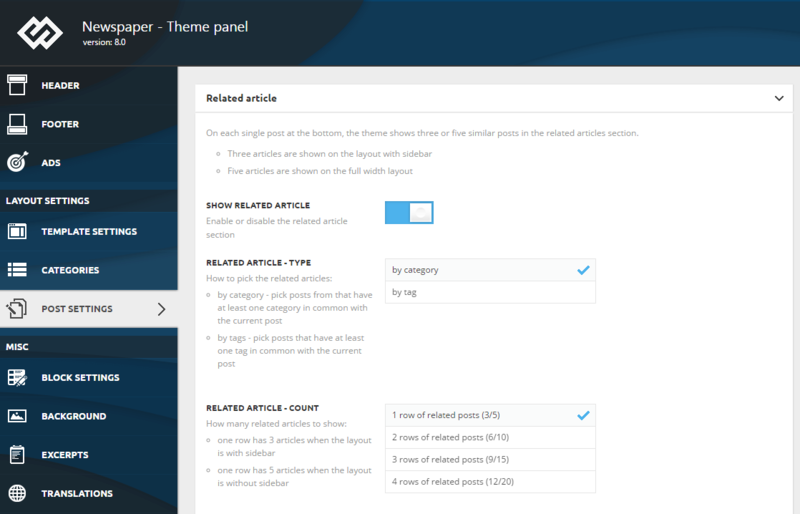 In Newspaper >Theme Panel > Post Settings > Related article, you can customize the way these articles are displayed. Show related – In the Theme panel you can enable or disable this function. Related articles – type – This option allows you to decide if the related post should be selected by category or by tag. Related article – count – This option allows you to set the number of articles to be displayed.